The traditional marketing landscape has changed and a new age is upon us. The Smartphone has become the primary tool to access information and find local businesses on the internet. This is reflected in the recent shift by major players such as Google, Facebook and Twitter toward a mobile centric strategy. The job of any marketer is to capitalize on growth in new markets and increase profitability for their clients. Mobile marketing presents a vast and unique opportunity for the local marketer. It provides a space to define services and provide greater value to local businesses. 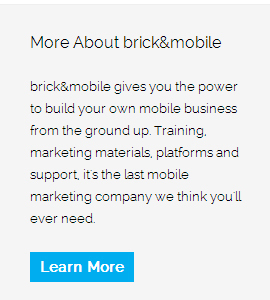 brick&mobile has partners all over the world that are capitalizing on this opportunity everyday. They are very excited to get started on their mobile journey and ask many questions to in order to define their best course of action. What do you think is the most common question I get asked? As a Sales Manager at brick&mobile, the #1 most common question I get asked is “How much can I charge”? While I understand why people ask this question, I often think that the more appropriate question would be, “What am I willing to do for this customer in order to ensure the success of my service?”. The more you do, the more you may charge. What are some of the things that you’re doing for your clients that make both yourself and your customer stand out? As a marketer, the most important thing to remember is success is directly proportional to the needs of your client. In order to succeed, you have to achieve! In order to achieve, you have to set objectives. In order to set objectives, you have to understand the needs of your clients. Once you understand the needs of your clients, you are able to design and create effective campaigns that increase brand awareness and differentiate the companies you represent. By accomplishing this in a unique and distinguishing manner for your clients, it sets you apart from others in the marketing profession. 1) Do a Needs Assessment. Determine your client’s needs by comparing what they have and what they are missing, both internally as a business and against their main competition. Often, clients are missing a complete mobile strategy, other times their strategy requires a specific tweaking or refinement of their current course. Achieve optimal results by improving the offerings with regards to content, design and engagement. Continue to build from there with the mindset of going above and beyond currently implemented marketing techniques, of both your client and competition, by applying new forward thinking strategies. The better you are at determining the needs of the client and fulfilling those needs, the more you may charge. Stand out as an exceptional, and different trend setting mobile marketer. By determining your client’s current situation, you may begin to formulate the objectives for your client. Remember: Time + Effort + Creativity = Value. Whether the objective is increasing the customer base, expanding the reputation of your clients or helping them to achieve more loyal customers, it’s important to approach your objectives in the following ways. Create a baseline to measure your progress and set goals to improve the standards moving forward. Understand the gap that you’re bridging and work toward creating higher standards of quality that strive to improve on what has been previously done for your clients. Once you have a working baseline, you can always refer back to how far you have come and identify your client’s remaining needs. Goal achievement must become the new standard. Setting a course to achieve your goal, implementing innovative ideas and utilizing appropriate strategy will guide you towards achievement. By constantly improving your client’s mobile presence, strategy and reputation, you are in fact achieving this simultaneously. The higher standard you set for your goals and objectives, the more you may charge your clients. Going above and beyond what you have set out to achieve, constantly pushing your baseline forward and implementing new and creative ideas to keep your clients current, dynamic and unique, will result in the creation of a standard of excellence. If you are able to deliver this, over time, you will ultimately become the “Gold Standard” in your industry and your market. You will no longer be compared to what others are doing but others will be compared to you. When you become the “Gold Standard”, you can then begin to pick your price. Next time you want to know what to charge for your services, you will benefit by thinking about what you are offering and how you are willing to provide it. It is always important to remember that aiming to increase brand awareness and being different are two of the greatest ways you can serve your clients as a local marketer. Deliver a service that determines the needs of your clients, sets measurable and achievable objectives, and creates a standard of excellence in order to enable you to differentiate your company and your services in the market. Always think in terms of your clients and their customers, and set yourself apart from your competitors. Use the comments section to discuss different ideas that can help yourself and others grow the business and move your company's forward.